About: Fab Food Patisserie serve a variety of sandwiches, cakes, Danish pastries and beverages. Catering for vegetarians is also provided. 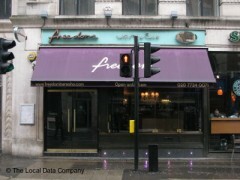 Described as the epicentre of London's gay social scene, Freedom not only plays host to a variety of art exhibitions, film premieres and after show parties, but also provides two bars: the ground floor which is popular during the day, and in the evenings, the basement bar which is buzzing with people. A range of European dishes and snacks are provided and catering for private parties of up to 200 people is available upon request. Went there to check the place to celebrate my friend's birthday next month. Very disappointed in lack of customer service. The bar staff seem to hand pick who they can serve regardless if you're there before the pretty boys. Avoid! my friend had her 19th here! it was awesome lol! love the atmosphere of this place only the drinks r a lil bit pricey but it's top especially if u like house music!! Recent refurb has made this place look pretty good. Won't be returning any time soon. Last Friday night, I was turned away as the Eastern European homophobic, tall bouncer said:'sorry we're very busy you can't come in" at 8:30pm where the bar could accomodate another 50 people at least, he didn't want us in. I've been to Freedom for 12 years and after a nice meal and brought friends from abraod, my boyfriend and I were humulitiated at the door of shame of Freedom.